I once said that I would take any pinball machine home if it was for free or had an extremely low price, no matter what it looked like and no matter how it played. The simple reason is that you can try and be surprised with any machine, and if it's not working for you, you can always practice your repairing skills and sell the result to a collector. So, when Arena was reported by my friend Lars as standing in front of the neighbouring bar, for FREE, we didn't take long to grab and carry it home to me. The only pinball game I had so far was The Machine (after F-14 was exchanged for it) and a second machine needed some space that I had to make first, next to my bed. I had not thought about a second machine all that seriously at the time because I was satisfied with The Machine so far. However, if Arena did anything good to me, it ignited the collector's flame. 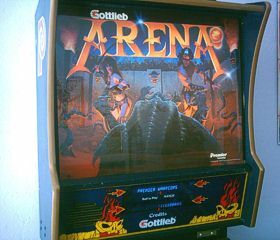 Arena was built in 1987 and thus had to compete against Williams' and Bally's big hits from the 80s such as Pin*Bot, Space Station, F-14 Tomcat and High Speed (naming some Williams System 11 games). To be honest, Gottlieb failed to build a solid base system which could compete with System 11: Gottlieb's System 80 had low sound quality, initially no sampling (synthesis only), absolutely no display ani-mation even though it had two 20-character alpha-numeric displays, and the gameplay was quite boring too. 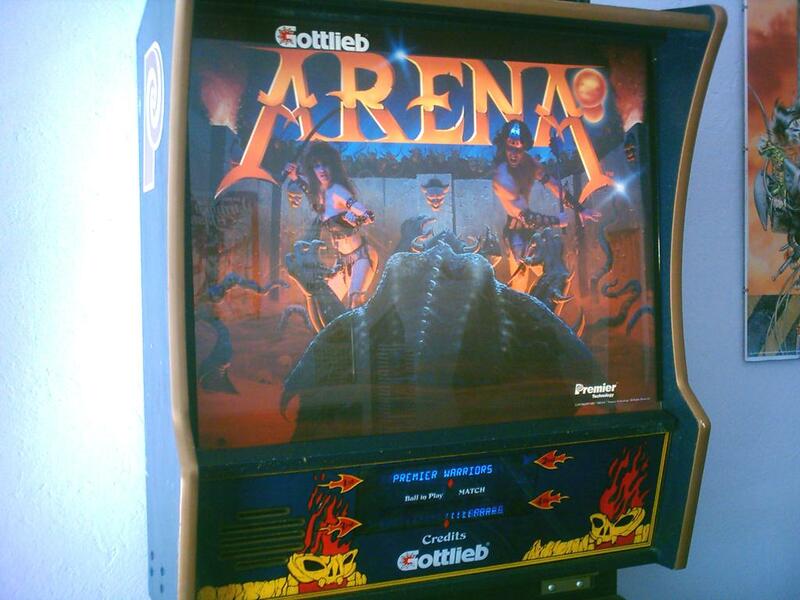 Plus, since the old Gottlieb games play slower and smoother than Williams and Bally games, Arena was a candidate for beginners and people who liked to do a quick round of pinball without really playing for points. But this, as a future collector, turned me off and distracted me from the game. And when it came to the technical stuff, I started swearing about what I saw. I was so frustrated! I still don't know where to make a factory reset and change game options (except for the DIP switches in the backbox). The game was assembled already with the legs and backbox since we carried it only a few meters into the house. 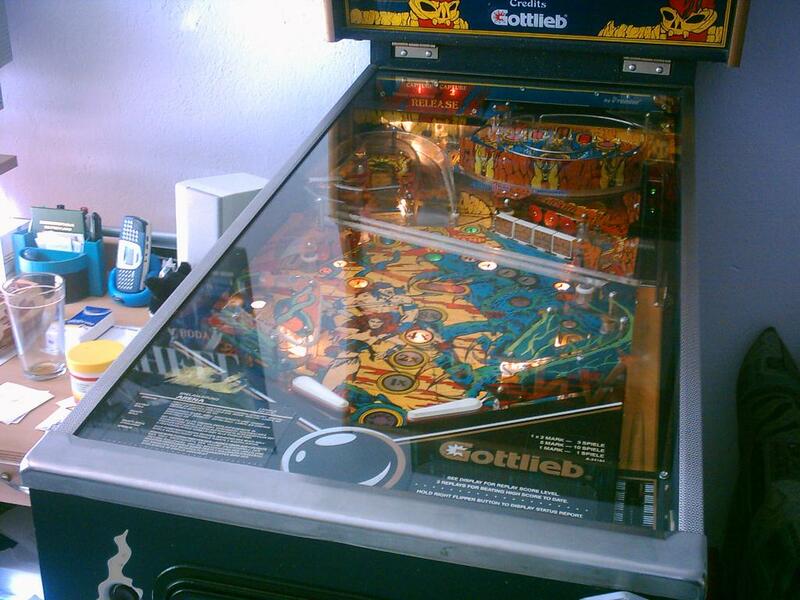 However, the machine had been left in the basement of the bar for years and thus it was very dirty with black and white cellar dust on the playfield and under the glass. Turning the game on, we found that the slam switch was marked as open, so we closed it and the game booted up; however, I was confused already at this point since normally a slam switch should be open and tilt the game when closing. Regardless, the game started and played through without hassles, so there was no major technical stuff to repair. After cleaning the playfield with a lot of isopropanol, including all removed plastics and a full rubber exchange, it looked quite good since the thick mylar still stuck to the playfield very well and had protected it perfectly over the years, so no retouching or mylar removal was required (which I wouldn't have bothered with anyway). Arena has a weird theme like some other older Gottlieb games. I had played two classics, Haunted House and Black Hole, in Peter's basement after visiting The Machine before the exchange. Both are amazing as they feature a reversed bottom playfield under a separate glass that is situated in the center of the normal playfield! If you can't imagine it, look at this photo from the IPDB. This is from Black Hole, a space-themed game which features six flippers (! ), the big Gottlieb trademark bumpers, drop targets, a wide-body playfield with lots of open space to roll a ball on, and of course this sick reversed bottom playfield. If I ever saw a Black Hole that works, and I had space and money, I'd take it just for the fun factor. It might be old and not my taste, but the colours, theme and the wacky playfield design make it very delicious for a collector. Not so Arena. It has your standard two-flipper playfield, however there are no bumpers at all, a big letdown to me. The artwork on the backglass is semi-photographic and looks like some horrible American fantasy comic from the 80s. 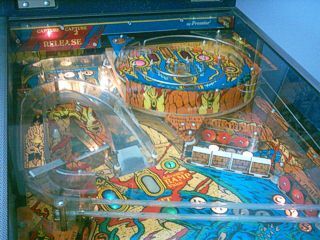 The playfield art is not any better and the colours are very wooden, with a lot of jungle-like browns, greens and blues. It distracted me even more, and then the sound effects, fully synthesized instead of sampled, no speech at all, and cheap 8-bit-like music. Two of the sound effects didn't stop looping after they started playing until another effect was triggered by the ball. In the worst case, this meant that the sound would loop even after game completion and not stop - d'oh. Everything else in the gameplay flow was not very cool; you just flipped the ball at the standup and drop target banks and tried to launch multiball by locking balls after turning off all the lane lights. It was not spectacular and felt very slow and uncomfortable compared to The Machine which was still a hyper-blast with every game. So, the decision was clear: since Lars had found Arena and I had reworked it together with him and provided a temporary home for it, we agreed to sell the machine as fast as possible. Sadly, Arena is not a collector's item and gave us only a lousy 125 Euros on eBay in the second auction (first auction got no bids at all), and nobody in the Pinball Network forum was interested. In the end, the bidder from eBay picked the machine up on a sunny day in the morning, having come with a transporter and his brother from 300 kilometers away. He was not a collector and only looked for a cheap game to decorate his home. Now that the space I had made was empty, it was time to get a new machine, a better one. No media on this one. Check the Internet Pinball Database entry.